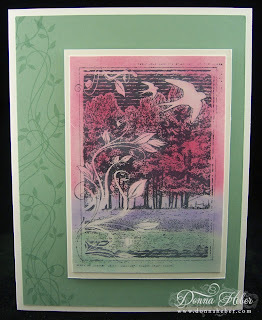 Today I have another card using a Crafty Individuals stamp. I wanted the main focus to be on the center image so I kept the background simple. 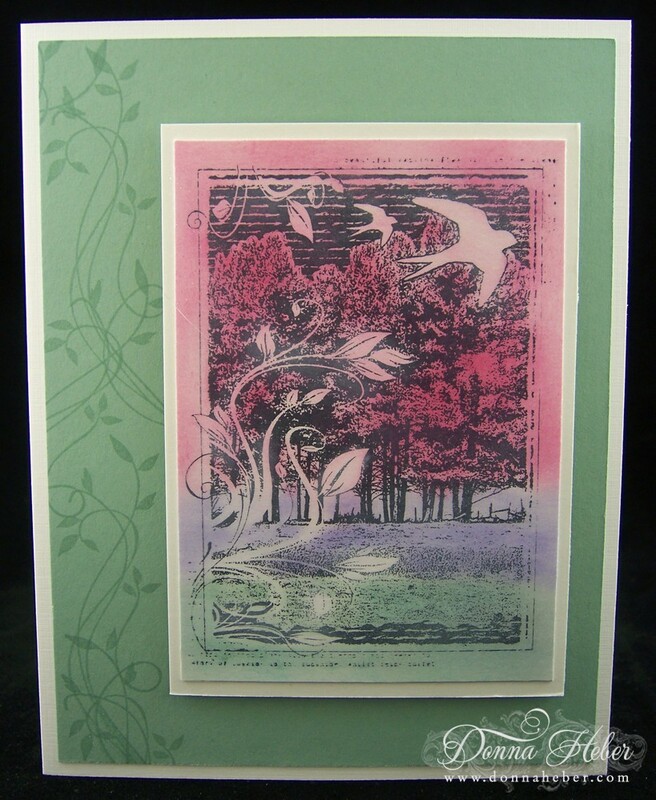 The scenery stamp was inked with StazOn Black and stamped onto Shimmery White paper. I then sponged ColorBox Frost White, Sage Shadow, VersaMagic Pretty Petunia & Purely Pomegranate. I thought the Leaf Tendrils stamp by Memory Box would compliment the main image and look nice as a border so I stamped it several times in Sage Shadow. After assembling the card I realized perhaps I should have added some accents with my color spritzer tool, but it was too late. I guess I will have to make another card ... lol. beautiful stamps donna, great scenery. love that sponging and that swirl with the leaves. thank you for leaving those comments this morning [ for me morning ]. Another fantastic card with great blending and stamping techniques. Maybe in a few years, my cards may reach the quality of yours? I am so glad I found your blog, you inspire me with ideas. What a beautiful card, gorgeous colors. That is such a beautiful card. I love seeing people make cards again. I think it is a lost art. Love the way the color makes the print more dimensional. Beautiful. Donna what a beautiful card....love how you sponged your image. Funny how critical we are of our own work always thinking we should have added just one more thing...I do that all the time. Looks great. Beautiful! Love the colors you used! You do scene cards so well! Beautiful! Love the sponging of the color! Intriguing card. I like the way you incorporated the leaves on the left side. It's just right adding interest without distracting from your focal scene. This is such a pretty card. I just love the colors and that stamp. I always enjoy looking at your projects. Beautiful card!! I love the colors you have used and the stamp. Just beautiful. this is so pretty. Looks kind of dreamy, really.